Certified Mail is a special USPS service that provides proof of mailing via a receipt to the sender. With electronic USPS Tracking, the sender is notified when the mailing was delivered or that a delivery attempt was made. Additional options like Return Receipt provide evidence of delivery in the form of a postcard signed by the recipient or an e-mail with an electronic copy of the recipient’s signature. 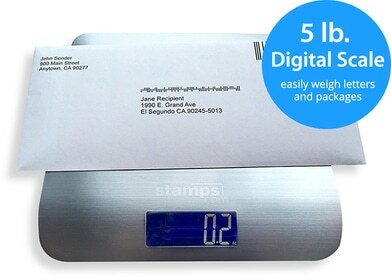 Stamps.com makes it easy to print Certified Mail and the cumbersome forms. With Stamps.com’s built-in forms, there is no need to handwrite Certified Mail forms any longer. Stamps.com stores all the info including Certified Mail number and certified delivery date in an easily accessible and searchable database. 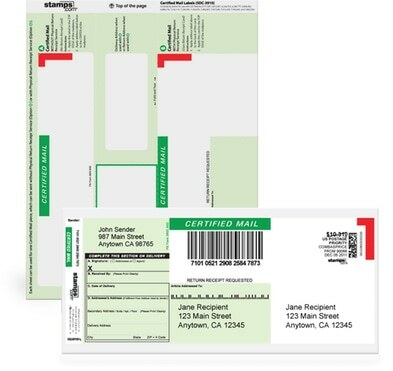 An approved licensed vendor of the USPS, Stamps.com allows you to buy and print mailing and shipping labels for all USPS mail classes using a standard ink-jet or laser printer. There is a monthly service fee of $17.99 plus applicable taxes, if any to use the service. Our free software (download here) connects you to your Stamps.com account where you can print certified mail. from the left navigation bar. From the “Printing On” list, select Stamps.com’s pre-formatted Certified Mail Envelope or Form. Keep in mind that only First Class and Priority Mail are options when you use a Certified Mail form or envelope, and that USPS regulations prohibit reusing forms already used for mailing. At this point, you may select options such as Return Receipt and Restricted Delivery. Remember, depending on your chosen services, unused portions of the form may contain the word VOID when printed. Load the form into your printer, then click “Print Postage.” We recommend you print a sample on a blank sheet of paper so you know the correct loading direction for the form. And remember, the method of affixing the Certified Mail form to your mailpiece will depend on any additional services you selected in Step 8. Pay close attention to the directions printed on the form to ensure you affix it properly to your mailpiece. A flexible label that lets you print postage, addresses and certified mail forms in one step, confirm delivery online and order copies of signatures. A cost-effective option that allows you to print up to four label sets on one sheet and automatically records the Certified Mail article numbers in your Stamps.com print history. Similar to the Three-Part form above, this option automatically records the Certified Mail article number in your print history, plus print up to three label sets on one sheet. A quick and easy option, this envelope is ideal for mailing items that fit into #11 or smaller envelopes. Just print postage, Proof of Mailing, Return Receipt or Restricted delivery in one step, fold and seal, and mail. Important Note: You must be on the Stamps.com Premier plan in order to use Certified Mail forms and envelopes. If you are not a Premier member, fill out and attach USPS form 3800.